I’ve heard that before, when my oldest son convinced my second son that he was adopted. It seems to be the thing for siblings to do. A decade later, when my second son tried it on his little sister, this mom was prepared. Come over here, Child, and Mommy will show you. You are definitely not adopted. My inquisitive eight-year-old took a careful look and I explained that the shared cM column means how much DNA you share with the other person. That shows us how related we are to each other. It took only a moment before she said, “Hey, your number is higher than Daddy’s!” I explained that this is an ongoing joke between me and her dad. She is more mine than his, but only slightly. 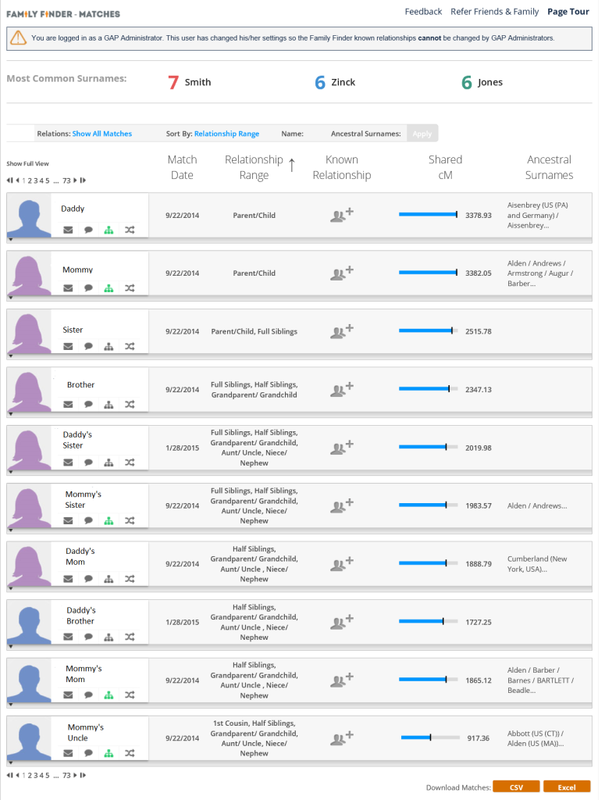 Of course, this may be due to our current testing and reporting limitations, and he also appears before me on her match list so Family Tree DNA’s proprietary algorithm thinks that he is a better match than I am, but she’s only in third grade so we won’t get into all of that. I’ll enjoy this while it lasts. My youngest descendant contentedly went off to school today, a printout of her top DNA matches in hand.